Issues-led communications agency The Whitehouse Consultancy is calling for pupils from ethnic backgrounds to apply for its Diversity Work Experience Scheme in an effort to encourage pupils to become more politically active and consider careers in politics. The Southwark-based business is running the scheme for the second year, inviting students from schools across Southwark and Lambeth to apply for a four week London Living Wage placement. 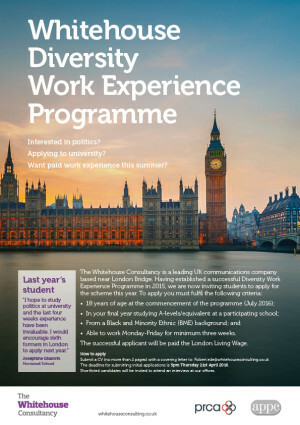 The ground-breaking programme aims to address the chronic lack of diversity within the Public Affairs industry by using Section 158 of the Equalities Act to actively recruit candidates from the Black and Minority Ethnic (BME) communities. An industry census conducted in 2013 by the Public Relations Consultants Association (PRCA) found 82 percent of the UK PR industry was ‘white British’, despite the 2011 Office of National Statistics census finding the British and Minority Ethnic (BME) population represented 20.2 percent of the total population in England. In London, the percentage increased to 55.1 percent, and 84 percent in Lambeth and 41.4 percent in Southwark. The programme is being endorsed by the Public Relations Consultants Association and the Association of Professional Political Consultants. “Last May, we saw record numbers of minority-ethnic MPs elected to the House of Commons. But while this shows some progress, under-representation remains stark in UK politics – which is reflected in our industry. The Whitehouse Consultancy is inviting applications from students attending participating schools in Southwark and Lambeth. The deadline for applications is 5pm, Thursday 21st April. For further information or comment from Helen Munro, please contact Mayar Raouf on 020 7463 0698 or Mayar.Raouf@whitehouseconsulting.co.uk Chris Rogers on 020 7793 2536 / 07720 054189 or Chris.Rogers@whitehouseconsulting.co.uk.